Kamal Haasan’s daughter Shruti Haasan is one of the most talented and popular stars in the south film industry. The actress was snapped at the Mumbai airport with her mother Sarika on March 6, 2018. Shruti looked pretty in a brown outfit and seemed happy in the company of her mom. Sarika too looked pleasant in a blue ethnic outfit. The actress is these days in news for her alleged relationship with her beau Michael Corsale. The two are often snapped spending time and travelling together. 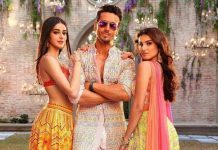 On the work front, the actress was last seen in the film Behen Hogi Teri which also had Rajkummar Rao, but failed to take off at the box office. Shruti is at present also shooting for Sabash Naidu and Yaara. The film Sabash Naidu is a thriller spy flick which will be directed b y her father Kamal Haasan. The film Yaara is still under the pre-production stage and will also star Vidyut Jamwal. Shruti was once asked about her personal life and said that she would never discuss about her personal life in public.